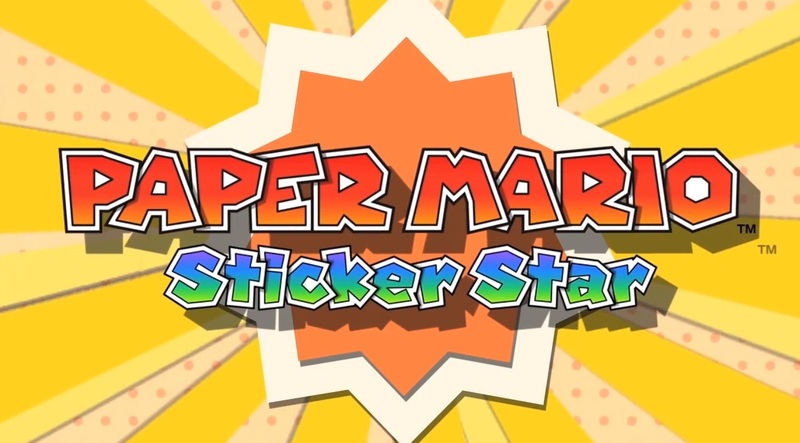 Paper Mario Sticker Star is for the 3DS system. Paper Mario Sticker Star is not like the original Paper Mario for the N64 or the Wii versions. 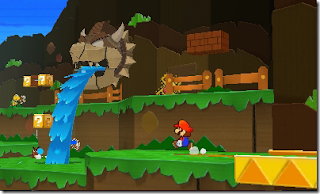 This version of Paper Mario is a new and fresh approach to the series. I personally loved the original for the N64 because of the RPG style. With Sticker Star there is still the RPG battle system but it's not nearly the same. With Sticker Star you actually go around peeling, buying, and finding stickers, You use these stickers as your battle commands. You have your basic stickers like the shoe (jump), and your hammer. But there are also a lot of different variations of these stickers like the fire hammer which does damage to all enemies. These stickers can also be powered up or you can even find them. These are known as shiny stickers or even flashy stickers which are much more powerful version of other stickers. There are a total of six worlds and each world has it's own different theme and style like with most mario games. Sticker Star does stay to it's routes by adding a lot of humour within the game. There were several times in the game where I had a good laugh. So of coarse your roll is to save Princess Peach from Bowser once again. Basically what happens (without giving away spoilers) is everyone is at the sticker festival. While everyone is paying attention to Mario and Peach talking about the royal stickers Bowser sneaks in and steals one of the royal stickers. These royal stickers have great power within them and Bowser uses it to capture Peach and wipe the floor with Mario. Of coarse it is up to you to recover the seven missing royal stickers and rescue Peach. With Sticker Star I found there was a lot more puzzle work to do than any other Paper Mario. What I mean by that is you have to do a lot of back tracking to other levels to progress. I did enjoy this aspect of the game but some of the times you have no clue where to go or what to do next. There were to much hidden paths to find to advance to the next level. I did enjoy that there was lots to do. If not rushed it is a 12 hour+ game. No replay value but it is longer than most recent Mario games out currently. The exploration is a huge part of the game which makes it even more enjoyable. Most of the bosses are challenging but have the option to make it easier if you know what stickers to use. I do wished they kept how the original one was. You get into a battle, earn XP, gain levels, etc... I am very happy that they added something new to the series but I missed the original game play style. Sticker Star does stay true to the series of being a fun 2D style game with 3D environments and objects. These objects can be turned into super stickers which can deal a lot of damage or be a good support tool. Some of these include a fan or a vacuum or even a baseball bat. Each has it's own unique purpose. Overall the game play is as fun as it's always been and if your a Paper Mario fan I would check this game out you will have some fun. It is probably the worst one out of the three but still a lot of fun. 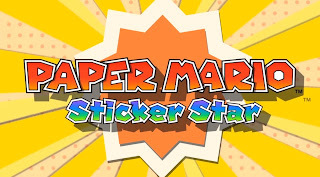 Paper Mario Sticker Star has your same 2D graphics as any other Paper Mario game in the past. You play as Mario who is made of paper and talk with NPC's who are also made of paper. Almost everything in the game is made of paper. You play as 2D but the environments are 3D. The game is very colourful and has a lot of variety. Each world you enter is a completely different environment. A little feature that I found really neat was whenever you got a shiny or flashy sticker and moved your 3DS around the stickers will shine as you move it around. Water coming out of a cardboard bowser mouth? 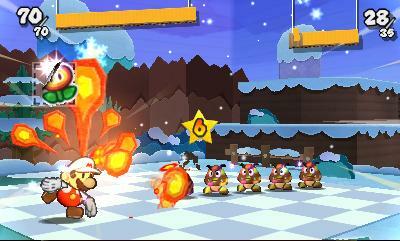 Paper Mario Sticker Star also has a lot of great battle animations. The animations on the enemies and environment are very well done. They really did stay to the name of “Paper” Mario. The sound track for the game is what you would expect from any Mario game in the series. So catchy and soothing for the most part. When you go underground they did re use the classic soundtrack from Super Mario Bros. The audio is what you would expect from any Mario game. Never bad, always good, and always catchy. It seems to relate to the game very well. Overall Paper Mario Sticker Star is a very fun and enjoyable game. There are some things that do affect the overall score. Some of the younger audiences may find this game confusing at some parts and well get lost and will not be able to figure out where to go next. Most of the time they do not tell you where you need to go, it's basically go and figure it out for yourself. There were a couple of times I needed a small walk through to figure out where I needed to go next. I also believe they really didn't need to add the RPG battle system in this version of the game. Yes, battling with the stickers is a cool and new concept but when you win a battle it doesn't really feel like you've accomplished anything from doing it. Yes, you may earn coins or health when you defeat them but I missed when you gained experience, levelled up Mario, use badges, etc... That was very fun to me. 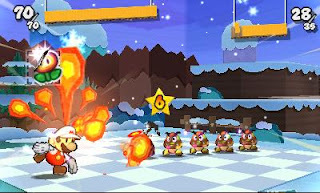 Overall Sticker Star is a fun and enjoyable game but if your looking for the “old” Paper Mario this is not it. But try it anyways, you may have a good time as I did with it. I think I found the same game on http://www.GameOnline.co.id for free play, but maybe the graphic's different.